CONTAINS MILK, EGG, WHEAT AND COCONUT INGREDIENTS. 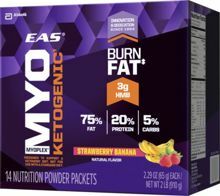 Whole Egg Powder, Butter Powder, Whey Protein Isolate, Coconut Milk Powder, Calcium-B-hydroxy-B-methylbutyrate Monohydrate (HMB), Natural Flavor, Less Than 2% Of: Gellan Gum, Stevia Extract, Ascorbic Acid (for freshness), Mixed Tocopherols (for freshness), Monkfruit Extract, Sunflower Lecithin, and Calcium Silicate. CONTAINS MILK, EGG, AND COCONUT INGREDIENTS. Eating foods high in fat, moderate in protein and very low in carbohydrates is the foundation of a ketogenic meal plan. 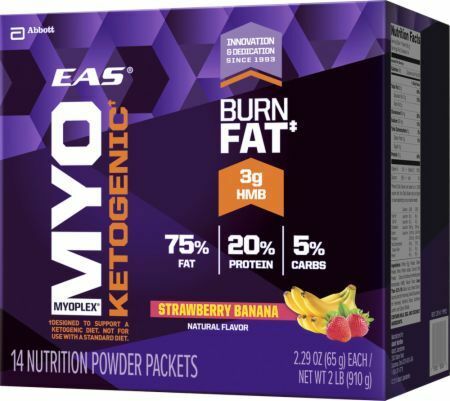 Myoplex Ketogenic Meal Replacement Packs are meal replacement powders with 75% of calories from fat, 20% of calories from protein and 5% of calories from carbohydrates to make them a great support for a ketogenic meal plan. Reference: Johnston, et. al., 2006. What can affect your adaption phase? the perfect meal replacement or supplement to take your diet to the next level.